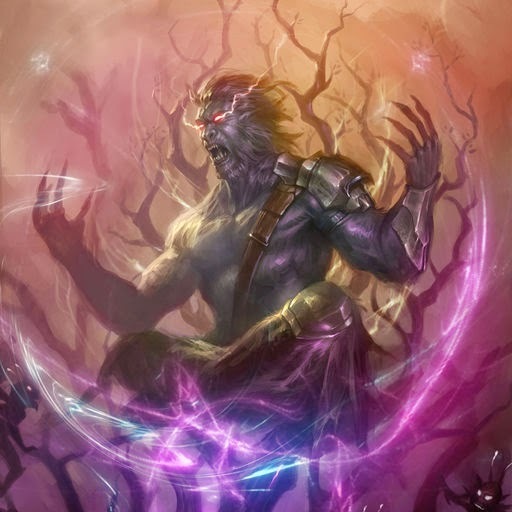 As a returning player and someone who only recently started playing competitively in constructed, I figured why not start off my first article by saying what I believe to be the best card in Solforge. First, before I give away what I think the best card is, let me explain some very important occurrences I have noticed about the game. As in most games, the first step to anything is deciding, what makes me win more than other people? Why do I lose, what makes me win, what made my opponent win, what made my opponent lose? These are the questions you need to be asking yourself after every single game. Well, in case you don’t, I have the answers to at least a vast majority of situations. The first thing I want to talk about is consistency. If I draw many more level two and level three cards then you, I will almost always win. That is a very real fact about the game, and one that many people complain about. Level screw is one of the most talked about topics, and there are many reasons why I feel this is the number one factor to think about when building decks and selecting cards. There are three decks I consider to be above the rest right now, and they are robots (red bots mostly with a few other variations), BQ Tracker, and RoK decks. What do these three decks have in common? I already spoiled it, and the answer is consistency. Now, it is obvious that BQ and RoK have consistency because the word is literally printed onto their cards. Red bots have consistency because they usually include Oratek Battlebrand which levels extra cards, as well as a few overload cards that thin the deck. This in my opinion is one of the main reasons we see these decks always getting to the top, and that is because they consistently do what the player wants them to. Second most important factor is crisis control. This is why BQ is very strong. The ability to kill a giant creature that gets out of control is crucial. Oratek Explosives, Flamesculptor + RoK, BQ, all of these decks have their own way to deal with a creature meant to be unkillable. Going back to my original point, what is the way you lose a lot of games or win? The answer to a lot of those games is a creature that runs away with the game. Thundersaur is the easiest example of this (accompanied with a few Lysian Shards), but I have certainly died more than a few times to monster creatures that I couldn't kill. Redbots can sometimes get that creature with 15+ armour that you just can’t kill. RoK decks don’t really have this luxury really as a win con, but they have a lot of what I would consider is the next most important. If you don’t have a way in your deck to crisis control, you’re going to struggle getting over 50% win rate. Raw card strength comes in at number 3. In case you didn't realise, the top played card at the last WCQ was Frostmane Dragon. Holy crap, that card is a monster. It is undeniable that cards that are just crazy good on their own are going to be good when you also support them. RoK, Oratek Explosives, even removal to protect your eggs make this card absolutely even more bonkers. Cards that generate value by themselves are always just simply going to be good, Nexus Aeronaut, BQ, Tracker, Sculptor, the list goes on and on. Not surprisingly these cards are all in top tier decks and for good reason. In a turn where you draw tracker, but NEED to make two other plays that turn, you can get your tracker back later and level it for going into power level 2. In power level 2 you can get a creature straight from level 1 to level 3. Multiple times I have gone 2.1 - Tracker lvl 1 + other card, 2.2 - Soothsayer level 2 get back the tracker level 2 that is now in your discard pile, play the level 2 tracker + invoker and then you now have a brand new level 3 tracker in your discard ready for power level 3. In power level 3, you can play 3.1 Tracker level 3, then 3.2 soothsayer back that tracker and play it again for ultra value. In 3.1 if soothsayer is your only level 3, you can play him and get back himself!! That is two 16/15s for the price of one. The real value is from playing a 3.1 level 2 Broodqueen, then getting the level 3 version back in 3.2 and playing it again which let me win one game handily. Don’t ask me how, but I currently am 6-2 with this list for a 75% win rate. Very clearly a work in progress, but a great showing of Soothsayer's power. Have a card in your hand that needs to be levelled? Soothsayer for Esperian sage and level it! Have a card in your graveyard that needs to be levelled? Soothsayer for it, and play it or sage it! 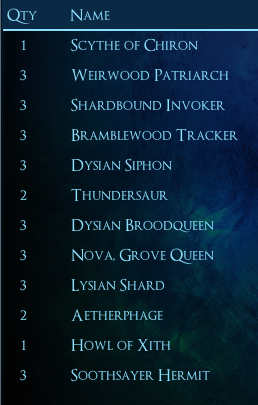 Soothsayer is literally Killion 4-6 in this deck, as well as a lot more.The Hinterland Watchman has won me several of the games at player level two alone with shards and seals (with the help of a timely Soothsayer of course, that is the point of the article after all :P ). Soothsayer brings a lot of these inconsistent strategies together in ways that are just absurd. Your two card combos now can be played across multiple hands. Your removal is always timely. Your cards you need to be level 3 you didn't see in power level 1 are magically all now level 3 by 3.1. You win more and more, and its all thanks to this lovely card! Go sooth, or say home. You can watch me play that list and experiment how quickly I can evaporate silver trying to brew at www.twitch.tv/jimbozgrpz. 1. This card is level gated. If you are playing BQ+tracker (two more level gated cards), then it seems like sometimes you can't level all the cards you need when you need to. 2. In 1.1 and 2.1, this card is meh. Maybe it's just me, but I ALWAYS seem to draw this, Toorgmai Guardian, and Tomb Pillager in x.1. So while I've seen ridiculous plays (and have made them myself) with this card, I tend to stay away from it when I'm playing Tracker Queen. Your second deck seems to have mitigated my first issue, so I could see myself using it there. The main use...which I don't know how I forgot to mention it... is to play off of tracker and grab a shard or siphon at power level 2/3. It is amazing for that, and IMO spells are meant to be played primarily under leveled since most spells level very poorly. It is just really great having that shard/siphon 4-6 so you draw them at a much more consistent rate when you need to. 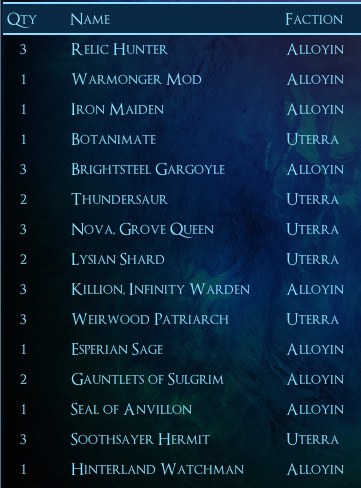 In the second deck you mentioned the Soothsayer's are Killion's #4-6, yet Killion is missing from the list. Just wanted to let you know. :) Was trying to brainstorm what to take out for 3 Killions. Well, long days are long. Great write up! When I saw the release of Soothsayer, my MTG Eternal Witness days just flooded back and I needed to break it. However I kept struggling to find the right support for it, since there just always felt like there was another card that had priority PL1. But it seems I need to get back on the soothsayer wagon. I enjoy both of these deck variations for they fulfill my two favorite play styles. I am excited to test and tweak them myself. Once I get financially back on my feet, I will get my hands on some Nova's and Relic Hunters and get back into the competitive scene, since they are running the format currently.